Casuncad family's personal list of Quezon resorts is a combination of farms, gardens, beaches and public and private swimming pools from the cheapest (those beach that offer no entrance fee) to the coziest and luxury choices by Pinoys and tourists wanting to escape the maddening crowd in Batangas, Bulacan, Cavite, Antipolo, Laguna, Cebu, Boracay, Puerto Galera, Palawan and yes, even Boracay. Quezon province definitely had so many white beaches, hidden from the eyes of the Manilenos (Manila residents) and sad to say even from the Quezonians themselves. Little have some exotic beaches been explored knowing that they offer a cool, quiet and comfortable alternative to beach resorts and swimming pools in the Philippines, best for summer vacation and during Mahal na Araw or Lenten Season. I'll be featuring Quezon province resorts from Plaridel, Tagkawayan, Perez, Atimonan, Alabat, Macaleon, General Luna, Andangan, Lucena, Tiaong, Pagbilao, Infanta, Sariaya, Lucban, San Antonio, Dolores, Candelaria, Tayabas, Sampaloc, Real, Polilio, Mauban, Jomalig, Caliraya, Padre Burgos, Calauag and more Quezon resorts that have swimming pools both private and public. A Google Earth or Google map will be included for a guide on how to get there if you commute or have your own car to travel to their location. Hotline contact telephone numbers, email address, Facebook Page and website URL if resorts have one will also be provided so you can contact them for frequently asked questions regarding resort rules in swimming attire and suit or trunks, if they allow bringing food inside, is camera allowed, entrance fees, reservation and accommodation, room and cottage rates, resort photos / pictures so you can see the amenities, if there is available videoke, billiards, free wifi, basketball court, spa, aircon rooms and other outdoor sports fun and leisure activity places. A good choice for some is if the resort is a venue for team building and had facilities for seminars and trainings. Here in our exclusive featured Quezon Resorts section, we will be featuring any of the lucky beach and swimming pool as well as hot and cold spring resorts above. This is of course if our family gets invited to post a review page. We'd gladly visit your place, write an honest review of your customer service, resort amenities and offers, promos (if you have), pool and beach cleanliness and so on. 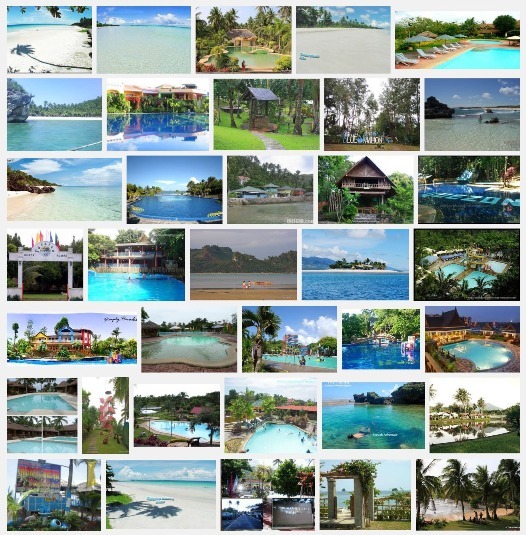 Reminders that we will be taking pictures of your paradise venue and shooting our own video which we will need an authorization letter from your management that we can use it in our website and have it included as part of our collection of the most beautiful places in the Philippines that tourists and Pinoys alike, visit during summer vacation and in times you need to relax and unwind. If you are lucky, we might even have your Quezon resorts feature video put in our home page if people visit them often and like it. The family loves to visit waterfalls and we've been to quite a few already but as part of our aim to have the largest most useful informative website About Philippines, we are glad to announce that on this page is also where you will see the different hidden and popular waterfalls resort in Quezon province. If you've got something to request for us to have featured here, please use our form below.